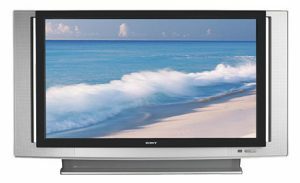 When the Sony KDS-R60XBR2 TV lamp is reaching end of life, you will see a message on screen and the lamp indicator on the TV will start flashing. Other end of life signs may also include darker images and colors that look off. Find this lamp on Amazon. Remove the outside Sony XL-5300 projector lamp cover. Click the switch open to remove the lamp cover. the marks on the lid and the case line up. Remove the door. Pull out the Sony XL-5300 lamp. Hold the indents on the top and bottom of the lamp, and pull the Sony XL-5300 lamp straight out. Do not touch the inside of the lamp compartment. Never touch the glass portion of the lamp or the surrounding parts. 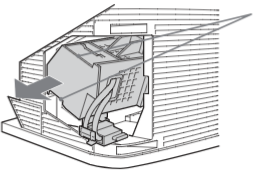 NOTE: This projector lamp contains mercury and should not be thrown into regular garbage. Recycle your used lamps! Put the new Sony XL-5300 lamp into its place and make sure it’s securely mounted into the compartment. Failure to do so may cause a fire or the screen to go dark. 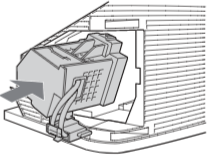 NOTE: The lamp compartment is tilted, as shown in the following illustration. If the Sony XL-5300 lamp is not securely reattached, the self-diagnostic function may be triggered and the POWER LED blinks three times. Reattach the lamp door. To secure the door, turn the knob to the right while pushing the door in, until the marks on the lid and the and the case line up. Then, turn the screw clockwise to tighten the door. right side to secure the cover. 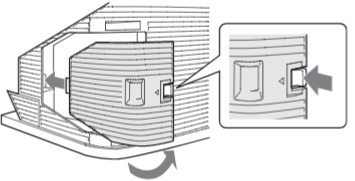 You are ready to reset the Lamp Replacement option in order to track the hours of projector lamp. Until you set the Lamp Replacement option, a message announcing that the is at the end of its life will appear every time you turn on the TV. You will need to reset. 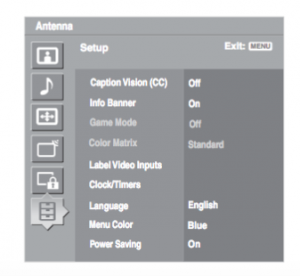 After the Sony XL-5300 lamp is replaced, you must select this Setup option or this message will continue to appear when you first turn on the TV. Select this option after you replace the lamp. lamps may burn out before the lamp replacement message appears on the TV. Press the MENU button on the remote control. Scroll down to the SETUP option. Scroll down to the LAMP REPLACEMENT. Press ENTER. A prompt appears asking if you want to reset the lamp hours. continue to appear when you first turn on the TV. Don’t settle for anything but the best for your Sony KDS-R60XBR2 TV. When buying look for the seal of approval. If you interested in going green with your KDS-R60XBR2, you can replace only the projector bulb and re-used the plastic casing. This can save your money plus help reduce waste. Watch our training video to learn more.